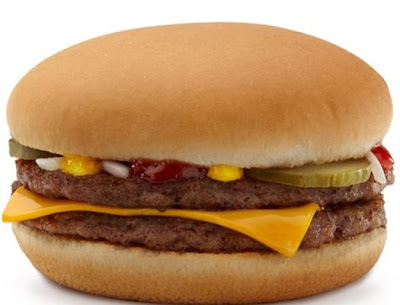 According to a Freakonomics reader and this follow up New York Post article, the McDouble--at 1 USD in the US (and 9 HKD in Hong Kong) and packing 390 Calories, 23 grams of protein (half a daily serving), 7% of daily fiber, 20% of daily calcium and iron, etc.,--"is the cheapest, most nutritious, and bountiful food that has ever existed in human history." Sadly, for some reason, we don't have a McDouble in the Philippines. What we do have is the Double Cheeseburger, which for 99 PHP (or 2.28 USD) you get a whopping extra slice of cheese more. For 1 USD, the best you can have is the Cheeseburger--if you can get over the sadness that one beef patty will inevitably bring. And we're only talking about burgers made of real meat here, so Burger McDo clearly does not count.